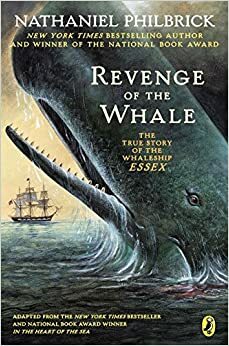 One peaceful day aboard the Essex a sperm whale attacked the ship, Essex; as the angered whale crashed into the starboard side until it toppled over. Water gushing into the gaping hole. The ship’s three whale boats survived in useable but slightly concerning condition. The crew split into three groups and went on the boats to set sail to find land. The whole adventure became a long quest for food, water, and shelter from the burning sun. Over the course of their journey, the crew of the Essex just barely survived from other catastrophes. This fictional tale of Revenge of the Whale has a constantly changing mood. It changes based on what happens to the sailors such as, a new food or water source, or a dangerous event. The Revenge of The Whale by Nathaniel Philbrick is filled with suspense and excitement. During the novel, an attachment is formed with the reader and the characters after the attack, and is strengthened by the constant struggle for survival. This book might appeal to someone who enjoys a realistic fiction novel filled with a lot of action and at some points, sadness. Although there is no sequel to this children’s literature novel it was still enjoyable and adventurous.